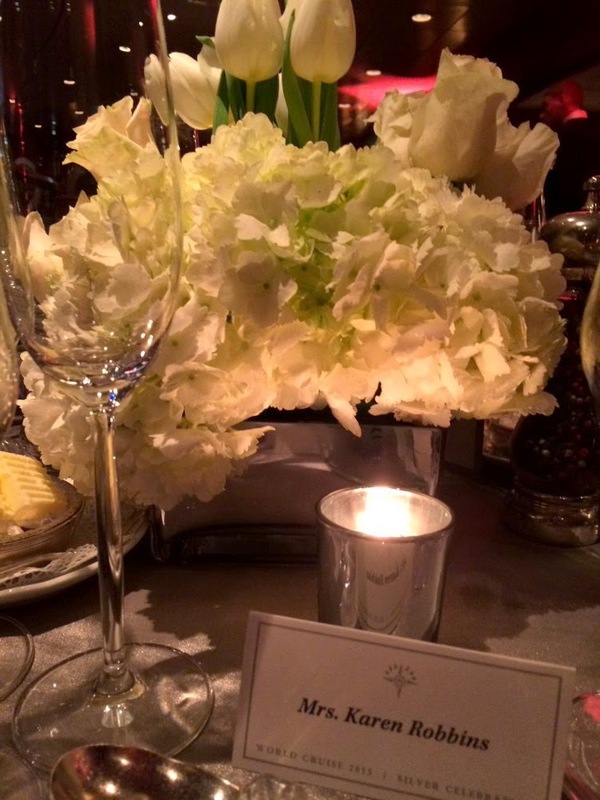 Wednesday evening was said to be a Gala Event. And it was! 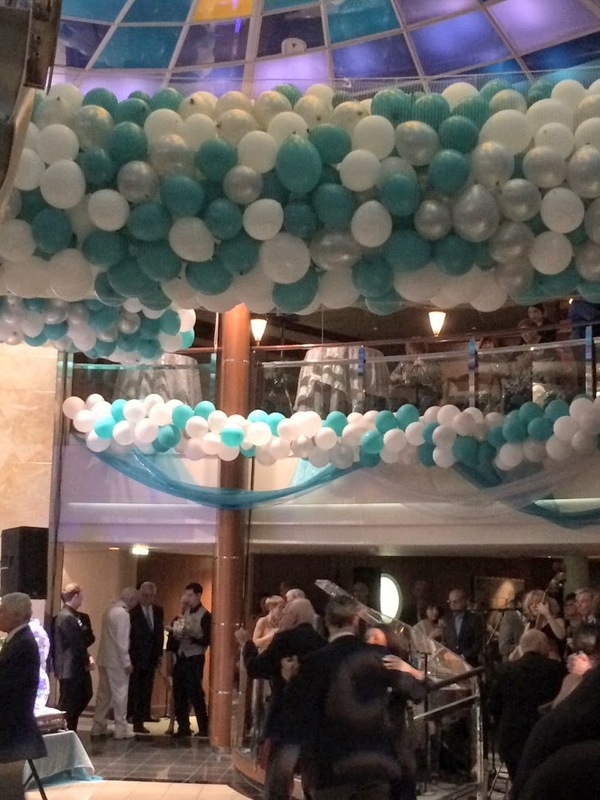 It began in the atrium of the Crystal Serenity that was decorated with balloons festooned everywhere. Big band music encouraged dancers to the dance floor, many with a dance host. It reminded me of Annie on her cruise in my book, In A Pickle. Because of the start of the World Cruise and the celebration of Crystal Cruises twenty-fifth anniversary, the president of the line, Edie Rodriguez, who earlier had greeted each guest personally as we embarked, gave a send-off speech followed by a dance with Captain Egil Giske, who is captaining his first world cruise. Then balloons fell everywhere and were promptly attacked with toothpicks. Bob and I broke a couple and then headed for the main dining room for our special dinner. Dinner was even more spectacular. Each table was set with so many glasses and pieces of silverware and a large beautiful flower arrangement in the center, I wondered where the food would go. As each course was served, the waiters would circle our table of six, each with a dish in their hand and together would place the dish in front of each diner. Our first course was a mound of crabmeat surrounded by an avocado sauce with dollops of sour cream sprinkled with caviar. I could have stopped there but there was more. The pasta course was two large raviolis filled with a sweet squash. I should have stopped there but there was more. We each had a choice of main entrée, sea bass or beef (looked like filet mignon). We chose the sea bass and it was absolutely perfect accompanied by two small rolls of kale and rice. Of course there was dessert. I was on a roll. Why stop now? A chocolate mousse was covered by a crispy chocolate shell topped with a small circle of chocolate cake on which sat a little ball of ice cream. A chocolate lover’s dream! Stuffed to the gills, I was afraid I was going to start waddling as we made our way to the show lounge. Our entertainment was spectacular as well. An orchestra (mostly strings) filled the stage and we were entertained by Dean Martin, Frank Sinatra, and Sammy Davis Jr.—well, actually their impersonators. Fun! It was a late night. Anything past ten is late for us anymore. It felt good to see our bed all turned down and ready for us. Morning came with a fog that obscured the tops of some of Miami’s skyline but by the time we had breakfast, the Sunshine State was living up to its name. 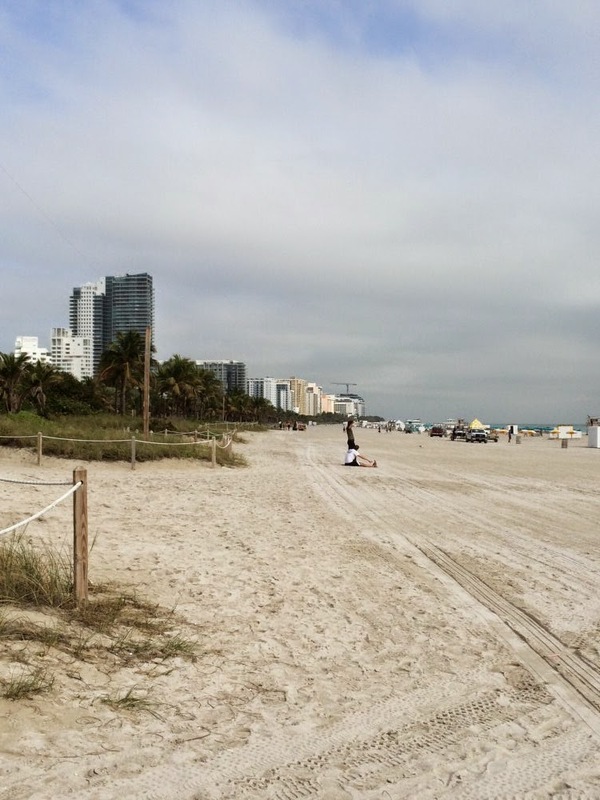 We boarded a shuttle to Miami Beach from the ship and spent our morning looking for a post office, enjoying the art deco area of MB, and walking to the ocean. Oh yes, and there was the shopping for things we’d forgotten. Who was responsible for packing the sun block? Tonight, Thursday, we sail at 8 PM. Our first full day at sea will follow. I’m ready! Let’s get started.